Raced mostly in nondescript claiming races both in northern California and Washington. Total Earnings: $36,404. Northwest Wine (Winnie) is a racetrack warrior. We don’t know what she has done or where she has been for the last five years. However, someone took the time to retrain her. Winnie was just rescued at Mike’s Auction on September 12, 2015. Winnie was ridden through the auction in a snaffle bit and western saddle. She was so quiet at first everyone thought she was a Quarter horse. She had a big belly, likely full of worms and her feet were in poor condition. She was hungry and shut down and picked at whatever was edible out of the sand before she realized there was hay waiting for her. Winnie is a very kind mare to handle. Under saddle, though, she is miserable. Anxious and jittery, she just hated being worked. 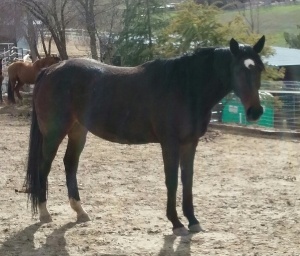 Her temperament did not suit her to be even a trail horse and it was decided that she would be much happier being just a horse so she was transferred to Heaven Can Wait.